L 20-25″(51-64 cm) W 50-64″(127-163 cm). Description: Sexes similar. 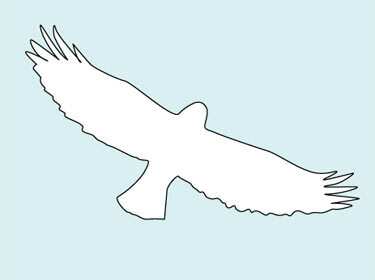 Variable plumage with three color phases: white, gray, and black. Large, heavily built falcon. Lacks dark helmet. Gray phase has black mustache. 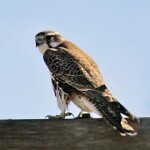 Unlike other falcons, tail extends far past wingtips when perched. Habitat: Found in grasslands and prairies both during migration and winter. Where in Nebraska: Extremely rare winter visitor. 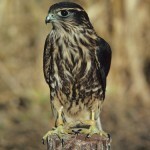 Field Notes: Largest North American falcon. 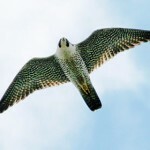 Fun Facts: The female Gyrfalcon stores prey during the breeding season withing 100 meters of the nest.